Know BAHS Class of 1967 graduates that are NOT on this List? Help us Update the 1967 Class List by adding missing names. Class of 1967 50th year reunion at the Atrium in Garland, Tx. At the Granville Arts Center 300 N.5th St.
Facebook page for info is at: Bryan Adams High School Class of 67 50th Year Reunion. Looking for contributions for the event and a link to our Gofundme account is provided. The reunion is being planned for October 20, 2017 from 7 PM to 11 PM. Friday night, Oct 20, 2017 at The Atrium in Garland, TX 75040. Address is 300 North 5th St. For more information contact me at *****@aol.com or Pat Skelton at *****@republictitle.com or Tommy Little at *****@gmail.com. Let us hear from you and come join the 50th reunion. Contact Tommy Little (*****@gmail.com) or Marty Landry (*****@verizon.net) or Larry Allen (*****@gmail.com) for details. 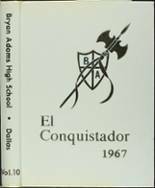 More 1967 alumni from Bryan Adams HS have posted profiles on Classmates.com®. Click here to register for free at Classmates.com® and view other 1967 alumni. If you are trying to find people that graduated in '67 at Bryan Adams HS in Dallas, TX, check the alumni list below that shows the class of 1967.